Recently, my sister-in-law asked if I had a recipe for banana bread without sugar. I didn’t, but since I’m the kind of person who loves a good cooking challenge, I decided to give it a try — make that several tries — until I came up with a winner. My husband and his sisters have a history of cancer on both sides of their family tree. I’m adopted, so I don’t know my inherited medical stuff. As a result, we’re all trying to be proactive with nutrition changes to counteract whatever hand genetics dealt us. I don’t want to spend my life eating food that tastes like cardboard, either. So, last week I bought three dozen bananas and set out to create a recipe for a refined sugar free banana bread. I tried many things to replace sugar in banana bread. Both honey and agave are on the no-no list according to Dr. Quillan, so I tried making banana bread with stevia in a 1:1 swap for sugar (awful!) and making banana bread using maple syrup (which changed the flavor too much). What I needed was something unrefined yet sweet. Then I remembered having breakfast at a vegan friend’s home one morning. She served toast with raisin puree in place of butter, and it was delicious. Incredibly sweet, but delicious. How would that work in bread? Turns out: brilliantly! Read This if You Have Health Concerns! If you have diabetes or another health concern leading you to limit sugar, please check with your doctor before making this. I am neither a nutritionist nor a doctor. 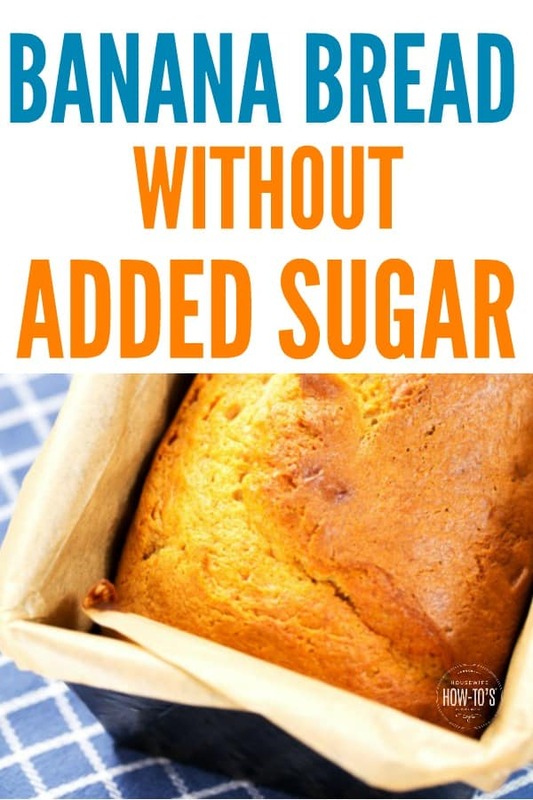 This recipe is offered as a delicious way to make banana bread without adding refined white sugar. As the nutritional notes below indicate, there are fruit sugars in this recipe. 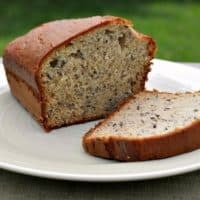 While it is a lower-carb banana bread, it is not a completely sugar-free banana bread recipe and may not fit into your particular dietary needs. Please consult a professional. You’d think that people who’d tried four unsuccessful banana bread recipes in two days wouldn’t have been all that interested in eating more, but you’d be wrong. As soon as this loaf was cool enough to eat, we could see and smell that I’d succeeded in my task. After the first nibble, my husband and I broke into broad grins… which we quickly shoved full of more banana bread. This one’s a winner. Enjoy! Preheat the oven to 350F / 180 C / gas mark 4. Grease a 9×5″ loaf pan. Drain the raisins and transfer them to the bowl of a food processor or blender. Add the bananas and blend until they’re pureed. In a medium bowl, combine flour, baking soda, and salt. These are your dry ingredients. In the bowl of stand mixer or large bowl, beat butter and eggs well. Add vanilla to the mixer bowl and continue beating. Add banana/raisin mixture and continue mixing until well-combined. Taste, and add stevia if desired. These are your wet ingredients. Stir the dry ingredients by hand into the wet ingredients. Do NOT over-mix. (Batter will be very thick.) Scoop batter into loaf pan and smooth the top with a spatula. Bake in preheated oven 60-75 minutes, or until a toothpick stuck in the center comes out clean. Remove loaf from oven, let cool 10 minutes, then tip the loaf out to continue cooling on wire rack. Serve warm or at room temperature, with or without butter. Each loaf makes 8 slices. Nutrition facts are estimates based on 1 slice. I am not a nutritionist and this information is only provided as a courtesy. If you have a specific health concern, you should consult your physician or registered dietician before consuming this food. Don’t worry if your bananas aren’t ripe yet. Wash and dry each one, then put them on a cookie sheet and pop it into a 300°F/149°C oven for an hour. The skins will turn black as the heat converts the fruit’s starches to sugar, which is exactly what happens in the ripening process. Thank you so much for posting this recipe! I only used 4 bananas and it turned out awesome! I know it’s refined sugar free, but do you know how much sugar (from raisins, bananas) per slice is in the loaf? Hi I’m wondering if you have had any luck replacing sugar with raisins in any other recipes? And if so at what ratio? It sounds like a viable option. Thanks. The only other recipe I’ve tried it in is oatmeal. Sorry! I haven’t tried it, but can’t see why it wouldn’t work! I added apple sauce to mine. Used Kerry Gold butter. The flour I have to use (no gluten, wheat or grain) tasted a bit thick without it. Kerry Gold butter is delicious stuff! 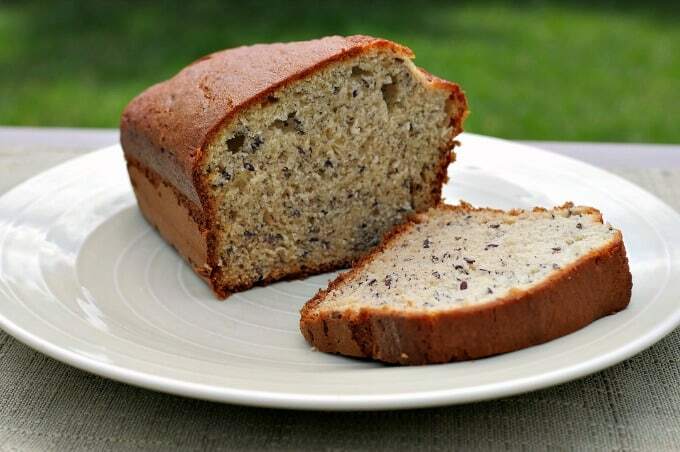 This banana bread is delicious, you would never know that it has no sugar and whole wheat flour. My kids and I loved it! Thank you for sharing this recipe. I’m curious, do you prefer it with only whole wheat flour, or the 1/2 and 1/2 way? I prefer it half and half. It’s lighter, and has a nicer mouth-feel. My sister is a diabetic. Will the raisens make her glucose level rise? I guess I’m wondering if using raisins has an advantage over sugar when baking banana walnut bread for a diabetic. Please let me know. I’d like to bake in the morning. Glad you told me that substituting Stevia did not work!! Debi, I’m not a nutritionist nor do I have diabetes, so I don’t know a certain answer to your question. I did find this Harvard Health article which seems to indicate raisins are okay for people with diabetes, at least in the small amount that’s used in this recipe. Thank you so much for all of your hard work in refining this recipe. I always feel so inept trying to make substitutions. I am eating my first piece right now and it is even a hit with my kids. I am transitioning into a life without refined sugar and this was a real gift. Thank you and God bless you. I’m so glad you enjoyed it, Jeannette! Your recipe is sweet and delicious. I used olive oil instead of butter, whole wheat flour only, and omitted the salt and the stevia. I added the eggs, vanilla and olive oil to the bananas in the blender. Without fluid the bananas would not puree. Best wishes to you and your family. I’m so glad you enjoyed it, Paddycake! It’s become a family favorite around here. Ah, thank you for pointing that out, Alex — it’s fixed now! Good for you, going without sugar. It’s difficult to do cold turkey, but you’ve about turned the corner now that you’re going on week 2. I think it was close to that before we really started noticing changes. Of course, we ignored it over the holidays and now are weaning ourselves again. Oh, the horror! My Mother has cancer also and trying to find ways to cut white flour and sugar out of my banana bread, I found that the riper the sweeter the bananas are so I let them get real ripe almost black and I put them (peeled) in the microwave for 5-7 minutes. Then I run them through a sieve and boil the juice down until it is clear but real thick. (That way it has concentrated the sugar instead of evaporating while cooking). It helps sweeten the bread as well as giving the bread an extract banana flavor. This might help you as my Mom doesn’t feel like eating, but will not turn banana bread down. PS Your recipes have helped us a lot. Thank you for your time in keeping this web-site and God Bless you. Thank you so much for those tips, Gayla! My husband won’t turn down banana bread, either. (He even ate two of my four earlier attempts which I thought weren’t fit for human consumption.) God bless you and your Mom. We’ll keep you both in our prayers! I’m going to try this. I have had Cancer twice and now serious liver issues. Thank you. God bless ? I’m sorry you’re going through that and hope you enjoy this recipe as much as we do.